Multiplex: Deleted Scenes — The Multiplex Store is now powered by Stripe! The Multiplex Store is now powered by Stripe! Before yesterday, the only way to use credit cards in the Multiplex Store was to use PayPal’s “Pay by credit or debit card” option, which I just learned can be a little… persnickety with some customers’ cards and/or e-mail addresses, so I’ve added direct credit card payment processing (powered by Stripe) to the Multiplex Store! You can still use PayPal (or PayPal’s credit card processing) if you like, of course, but if you’ve had trouble using your card in the past or didn’t realize you could already use a credit card without having a PayPal account, there shouldn’t be any problems now. No need to sign up for a Stripe account; a simple, secure Stripe pop-up will complete your transaction! 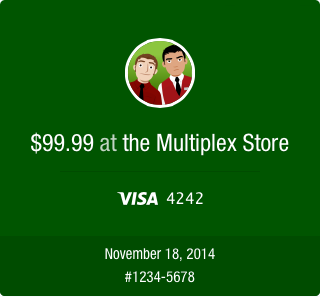 Don’t forget that throughout the 2014 holiday season, if you buy BOTH Multiplex books from the store, you’ll get $10 off! And for Patreon backers at the $3 level or higher, that’s in addition to your Patreon discount! This entry was posted on Tuesday, November 18th, 2014 at 11:39am	and is filed under Etc., Merch, Site News.